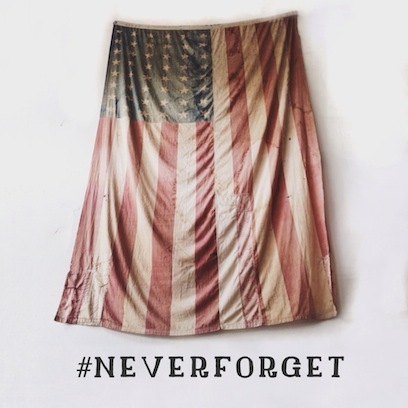 Today, September 11, 2014 you see across social media, friends sharing the hashtag #neverforget, accompany with stories of where they were and what they were doing 13 years ago on September 11, 2001. I really do not have to talk about what happened on that day because of course, we #neverforget. But there’s another side to the story that we all know. A story that not everyone can share. A story that has only impacted very few of us. On September 11th of 2001, I was in Richmond. Much like every Monday night, I left my television on ESPN, watching Sportscenter, watching whatever Monday Night Football recap that was playing. I awoke that morning to a television with Rich Eisen and Dan Patrick not covering sports. I was confused because I knew left my T.V. on ESPN like I always do. But it took me a moment as I started to pay more attention to what they were covering and showing images of planes flying into buildings. It took me another few seconds to realize the reason why this was being covered by ESPN was because the images were live from New York City. I watched and I realized that what I feared would happen actually did happen. It was less than one year, one month and one day of a difference in time that I realized America has more to fear than we realize. It was another morning in Richmond. On October 12th of 2000, I received a phone call from my older brother who told me that the ship our other brother served on, the USS Cole was attacked off the coast of Yemen. On that day, I learned my brother, Cherone Louis Gunn was one of 17 sailors on board the ship was killed in an attack that very few anticipated. On that day, I learned many truths that many have ignored or were unaware of. But I wasn’t alone. I, along with my family, the families of those who also lost a loved one and those directly impacted by an act of terror they had to live through, we all had an awareness that we knew this nation was under threat and that what happened to us WILL happen again. We KNEW. But America did not. After my brother’s passing, we received condolences and goodwill from across America. Senators, the Vice-President, national figures of all kinds wanted to touch our family. I remember the words of the General of the Joint Chiefs of Staff, Hugh Shelton tell me that the attack on a U.S. Destroyer was a slap in the face. President Bill Clinton himself, could hardly look my family in the eye knowing what had happened. The entire nation and our leaders knew what happened. But I don’t think they felt what we felt. And try as we might, we desperately wanted that communicated to them to stop what we knew what America was not prepared for. For the next 11 months, our families tried to beat the drum and tell others what we went through will happen again. But at the end of the day, we were not heard. Life went on. Elections were held. Blame was passed and we did nothing. In short we were forgotten. It’s an odd feeling to have. It’s like a version of survivor’s guilt. We were victimized and within the calendar year, despite warnings to the contrary, thousands and millions more felt our victimization. It might sound like I’m taking away from the memories and remembrance that we have on this day to promote a personal agenda and maybe I am. Maybe if I had be more vocal about my personal agenda, maybe if more people heard me, my family, the other families, just maybe if we demanded action that our leaders would have reacted. But they didn’t. Should I feel guilt for not being more vocal? Perhaps not. But it’s an unshakable feeling that we could have done MORE. As hard as it is for some to believe, there are some of us who STRONGLY believe that if America remembered what happened then, there would not be a need to #neverforget now. So just consider this your Friendly Neighborhood Reminder when you say #neverforget, that before 9/11, there was 10/12. And this is the last day we can #neverforget.